The South American fruit known as cupuaçu, cupuazú, cupuassu or cupu assu (Theobroma grandiflorum) possesses properties similar to cocoa beans, improving hair, nails and skin aspect. In addition to this, it represents a great energy source and contributes to cardiovascular health. Cupuaçu is the fruit of a rainforest tree with the same name. The fruit is related to cocoa beans and apparently its name can be translated as ‘food for the gods’. Indeed, cupuaçu is very nourishing, rich in fatty acids and with a similar consistency as cocoa butter. Trees reach maximum heights of about 20 meters and only bear fruit for about 5-6 years. They belong to the same genus as cocoa trees and, because they feed off the pristine Amazonian land, their fruit are a unique blend of potent polyphenols and antioxidant phytochemicals with extremely beneficial effects on human health. What does cupuaçu look like? Cupuaçu is a large, oblong-shaped fruit with a hard outer shell of a rich brown color. The fruit can weigh from 1 to 2 kilograms and is about the size of a medium-sized watermelon. You would need both hands to hold a cupuaçu fruit. The rich brown shell needs to be split open (with a hammer sometimes) to gain access to the lumpy, creamy white or pale yellow buttery pulp. The pulp also contains a handful (20-30) of grape-sized, oval, brown seeds that are usually discarded. However, the seeds can be pressed to obtain cupuaçu butter, rich in phytosterols and fatty acids. Cupuaçu butter is believed to possess excellent moisturizing properties and a high antioxidant content. What does cupuaçu taste like? Everyone who has ever gone near a cupuaçu swears by its wonderfully fragrant aroma, a powerful indicator of the fruit’s ripeness. The moment you split the shell of a cupuaçu, your senses get overwhelmed by a delightfully sweet, tropical aroma, reminiscent of pineapple and pears, with hints of banana and even grapefruit. The same goes for its taste: cupuaçu pulp has a unique tropical flavor that combines the richness of chocolate with the fresh and sweet flavor of pineapple, pears and banana. For this reason, the fruit works very well in smoothies paired with various fruits such as: pineapple, orange, banana, grapefruit, mango, acerola and the list can go on. 1) Helps lower blood pressure. 2) Contributes to lowering LDL (bad) cholesterol levels. 3) Boost energy levels. source of energy naturally. 4) Remedy for damaged hair, dry, cracked skin. 5) Stimulates skin rejuvenation as a result of its strong emollient properties and high antioxidant content. The pulp of the fruit is a great source of phytochemicals with strong antioxidant action, notably quercetin, kaempferol, isoscutellarein, theograndin, catechin and epicatechin. Cupuaçu also contains bitter alkaloids such as theobromine and theophylline as well as caffeine. However, the fruit contains considerably less theobromine, theophylline and caffeine than cocoa beans, but still enough to boost energy levels significantly. The feeling of having more energy after eating cupuaçu pulp is also owed to the fruit’s high fatty acid content which makes it quite the nutritious snack. Cupuaçu butter made from the seeds of the fruit is extremely nourishing as well due to its high fatty acids content and is mainly used for making sweets (cream pies, ice cream, smoothies, jams, tarts). It contains saturated fatty acids such as stearic acid and palmitic acid (around 50%), Omega-9 unsaturated fatty acids in the form of oleic acid as well as Omega-6 fatty acids in the form of arachiodonic acid. This means that the butter is an excellent emollient and makes a great natural cosmetic cream that can be used for improving nails, hair and skin aspect, especially for dry skin or dry, damaged hair. While soaps, body lotions, face creams etc. containing cupuaçu butter are already available on the market, best result are achieved when using the butter as it is (see Properties and Benefits of Cupuacu Butter). Indeed, both the pulp and the seeds of the fruit are rich in both unsaturated fatty acids (the healthy ones) and saturated fatty acids (the not-so-healthy ones). 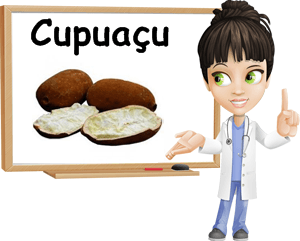 The idea is to eat cupuaçu in moderate to low amounts so that you don’t get a high intake of unhealthy fatty acids that may increase your bad cholesterol levels. However, when consumed occasionally, cupuaçu adds healthy unsaturated fatty acids to your diet as well and it is these unsaturated essential fatty acids that contribute to lowering LDL (bad) cholesterol levels and raising HDL (good) cholesterol. Still, moderate intake is recommended when already on a balanced diet. Conclusion. Overall, cupuaçu is a healthy fruit, with an incredible flavor. More importantly, it grows naturally along the pristine Amazonian basin, so there shouldn’t be any fear of pesticides that may reduce its health properties and nutritional value. Seen that it allows for a variety of delicious combinations, what would you pair it with for a unique taste experience? Where may I buy the actual fruit in the USA? Hello, Irene. Cupuacu grows in South America and is not found outside the continent in fresh form as far as I know. However, you may find cupuacu juice or powder for juice, frozen cupuacu pulp or cupuacu butter in health food stores in your area. If there aren’t any that offer these products, you can always look online. Amazon should have a great variety. I’ve also read about amafruits who sells cupuacu puree. Always remember to check the label to see just how much cupuacu these products actually contain and if there are any additives. To my understanding, you can use cupuacu butter for dry skin. In addition to being extremely nourishing, it has intense moisturizing properties (it’s a butter after all) and is rich in antioxidants that protect the skin from free radical damage. You can look up more sources and even write to your local supermarket to see if they can bring any cupuacu products in the future. Hope this helps.